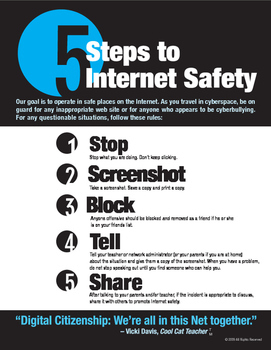 Students need to know how to be safe online. The commonly used method of "stop, block, and tell" is not a safe one. Students must know how to take screenshots before they block someone who does something to them online. If they do not, they will lose all evidence of what has happened. Use this safety poster and share it with everyone you know. It is important for students to be safe. Want to catch those 50% off deals? When I first list my products, I put most of them on sale for 50% off for the first day or two! If you follow my store, TPT will send you an email when I post something new. Also, it will show up in the status on the main page as soon as I post. To follow, look under where my picture is located and click on "follow me." Thank you!